The TSX is at a very dangerous juncture. Major, highly significant support lies at 15,000 (14,900 more precisely) for the index, and it’s being tested as I write. If this level is not held – I would suggest that the TSX will have entered into a whole new world of hurt. Seasonality soon improves for the index (as it does for the US markets) – so it’s pretty much now or never for the index. 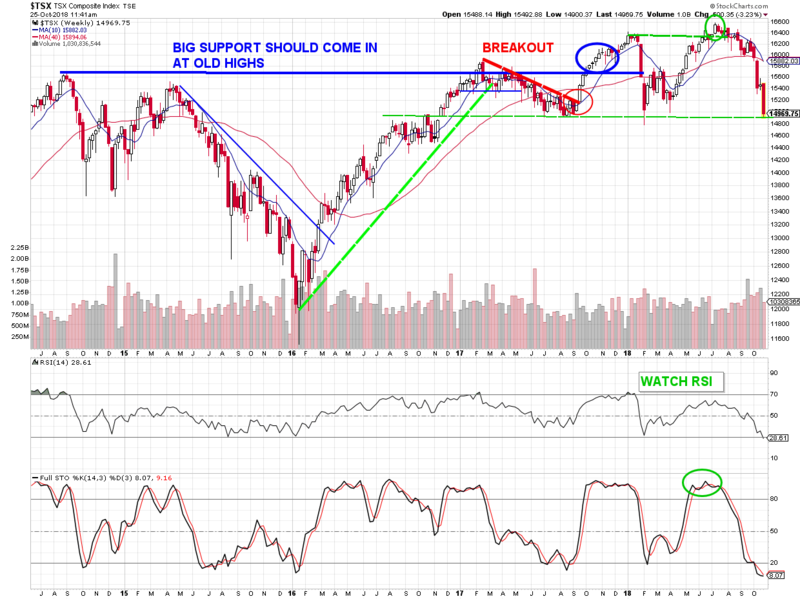 Note the oversold stochastics, and near oversold RSI indicators. They may signal that turn. Although today’s blog focuses on Canada and the TSX, it might be noted that yesterday the S&P 500 cracked its trendline, and broke neartermed support that lay near 2700 (January lows). It remains below its 200 day (40 week) SMA. The S&P 500 has NOT cracked its last significant low on the weekly chart of 2500…yet. But it broke the 200 day SMA. So, it’s not in as precarious position as the TSX. It may be that we will see a test of 2500 before this selloff is over. That would trigger a sell signal using my methodology (see my book Sideways). Below is a longer termed chart of the S&P 500 showing us that my key sell rules have NOT been violated for this index at this point. Much of the Canadian economy has been driven by housing prices. Household debt/ GDP that is the worst in the world at 101.2% of GDP. This, for example, vs. 79.5% in the USA. Despite the rising rates, Larry suggests (as do I) that the loonie has much further to fall – technically and fundamentally. He’s calling for an eventual low $0.60’s loonie. Yikes! Economic data out of Canada the past week has been less than stellar. After a miss in Q2 GDP last quarter and Q3 inflation numbers missing on Friday, GDP tracking models for Q3 are coming in below estimates. The Loonie is now 2.5% weaker vs. the dollar since the NAFTA deal, its peak of 2018. We have been bearish on the Canadian dollar throughout the year on the premise of an overly hawkish Bank of Canada pressuring both an over-leveraged housing market and the overall Canadian economy. The Canadian Dollar has weakened through a multi-month trend channel and now faces an upcoming Bank of Canada meeting, which we believe will pressure the currency even higher (weaker) against the U.S Dollar. Elsewhere in the Canadian Economy, new housing investment posted its first decline since 2014. Another strong signal Poloz and the BoC are breaking their economy’s back. You can read the entire BearTraps Canadian thesis here. By the way, BearTraps isn’t the only one noting Canada’s housing bubble. Here’s a blog by “Humble Student” on the same situation. So, what’s a poor lad (or lassie) to do? Despite the gloom presented above, I do believe we are near a buy point – from a sentiment perspective – for worldwide markets. You can expect a full Bear-o-meter report early next week that should offer insight into that intuition. While the TSX will likely be dragged along in any market revival, it is imperative to understand that it has many more factors against it than the USA. Unfavorable business policies brought on by the Cdn. Fed, increased pressure on our main exports (natural resources) via government policies and NAFTA tariffs, a real estate bubble, and rising rates against a potentially slowing economy will all affect our index. The US Financials have continued to slide along with everything else. Now that ZUB has broken the $28 support level, does this imply it is seasonally broken? I know Brooke thought risen interest rates are in fact bad for the banks. This means that old trends are broken–but because it is a widespread event, I wouldn’t say the sector in question is having unique problems. Thus, I would give it a week, see if the markets do in fact start to rally (3 + days up) and then if the ZUB or any other security in question doesn’t follow, we can assume it is not a buy candidate. As I have noted on other blogs–you have to forgive stocks normal sell parameters a bit during a blanket panic selloff. $USD STRENGTH AT PLAY HERE. Fundamentally looks like trumps tariffs are starting to cause some real pain for American companies. Couple that with the uncertainly of the upcoming USA elections and it really spoking the markets. And close to Halloween too. In the Financial Post’s 52 week listing this morning (Oct 27) fully 30% of the 52 week lows were preferreds. Seems very high. If this is indeed high, is this an indication money is coming out of the preferreds and into bonds? I’m not sure if that rotation is happening. But yes, they are interest rate sensitive so that makes sense they have sold off–probably opportunistic to buy pref’s sooner or later as rates cant rise too much, given the research I quote on this blog (aka Bear Traps).